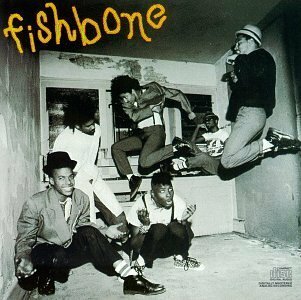 The cover of Fishbone's self-titled, six-song EP release in 1985 remains one of the most iconic album covers of all time. Village Voice music critic Robert Christgau famously opined of the cover, "Looking like postmodern vaudevillians who've just signed themselves in at the mental hospital, with sartorial details appropriated from the Specials, Dizzy Gillespie, Jimi Hendrix, Stepin Fetchit, and whoever, these six black L.A. teenagers show a flair for visual outrage worthy of George Clinton himself..."
Photographed by John Scarpati (who has recently released a book of his photos of bands called "Cramp, Slash, & Burn: "When Punk and Glam were Twins"), the energy conveyed in the album cover photo is mesmerizing. The six members of the band are crammed into a small, decrepit room. Two (Kendall and Chris) levitate in mid jump. Drummer Fish seems bemused by the scene in front of him. Norwood and Dirty Walt both seem to be summoning some unseen spirits and Angelo, looking straight at the camera, with a big smile on his face, appears to welcome the viewer into the mad, crazy world of the band and the bouncing, kinetic sounds contained on the vinyl grooves inside. The photo is pure visual gold. So imagine my utter surprise when an outtake from the same photo shoot finally emerged this weekend after 27 years! The newly released photo captures the band in another moment of manic mayhem. Kendall is in the middle of a perfectly executed Bruce Lee-like roundhouse kick to Norwood's face. Fish seems to be looking for cover in the corner. Dirty Walt looks quizzically at the camera and Angelo is covering his face in nervous exasperation. Chris Dowd covers his face in mock horror. A case of art imitating life? 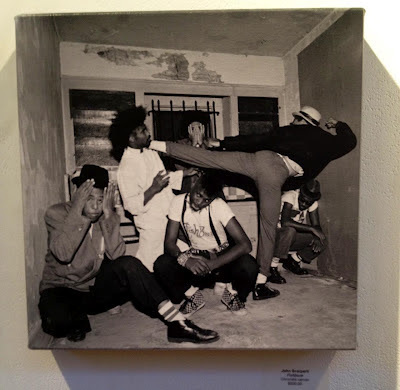 Credit/respect to Alex Gonzales from VEVO, a huge Fishbone fan who saw the photo exhibit, bought the photo, shared it on Facebook, tagged Fishbone members and let thousands of fans see it. 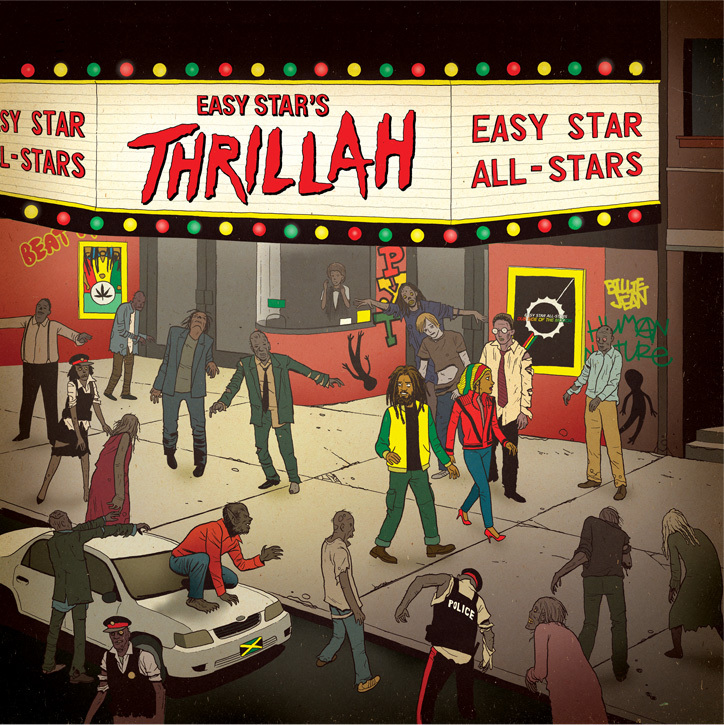 Following up on the hugely successful reggae tribute albums of Dub Side of the Moon (2003), Radiodread (2006) and Easy Star's Lonely Hearts Dub Band (2009), Easy Star All-Stars is poised to release a reggae adaptation of the greatest selling record of all time – Michael Jackson's "Thriller". 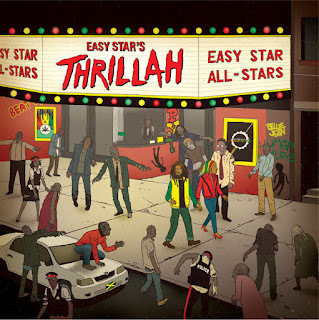 The album, titled "Easy Star's Thrillah" will be released August 28, 2012 (a day before what would have been Jackson's 53rd birthday). The album brings back several reggae stars from previous Easy Star albums, including vocalists Michael Rose (Black Uhuru), Steel Pulse, Luciano and Mojo Morgan (Morgan Heritage). The album will be preceded by the July 10th digital release of the Billie Jean EP, which includes two album tracks, along with non-album remixes and a dub version. To celebrate the announcement of the release, the band is making a free download of their version of Billie Jean available. All you need to do is provide an email address. The band will be embarking on extensive U.S. and U.K. tours this fall to promote the new album. 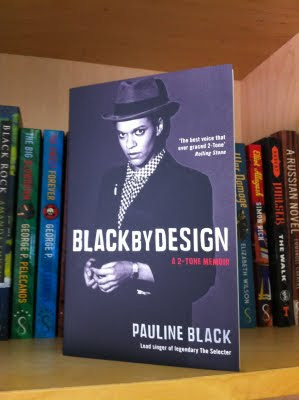 Pauline Black's Memoir "Black By Design" Now Available In The U.S.
Pauline Black's memoir 'Black By Design: A 2-Tone Memoir' is officially available on bookstore shelves throughout the U.S. today and for sale online from Amazon in the U.S. While the book provides a insiders view of the birth of The Selecter and 2-Tone in Coventry, its really more a tome about the search for identity. The book pulls no punches when it comes to painting a picture of the trials and tribulations Black faced as the adopted bi-racial child of white parents living in the suburbs of London. More importantly, it examines issues of racial identity during a time that the U.K. was struggling to confront its own racism and the challenges of assimilating Black and Asian immigrants into British society and culture. Black was interviewed yesterday on the NPR radio show Weekend Edition by Scott Simon about the release of her book. Listen to the whole interview here. The long wait is over! The man who wrote ’3 Minute Hero,’ ‘Missing Words,’ ‘Celebrate The Bullet,’ ‘On My Radio,’ and the track that started it all, "The Selecter," (the flip side to The Specials "Gangsters") has finally released new music. 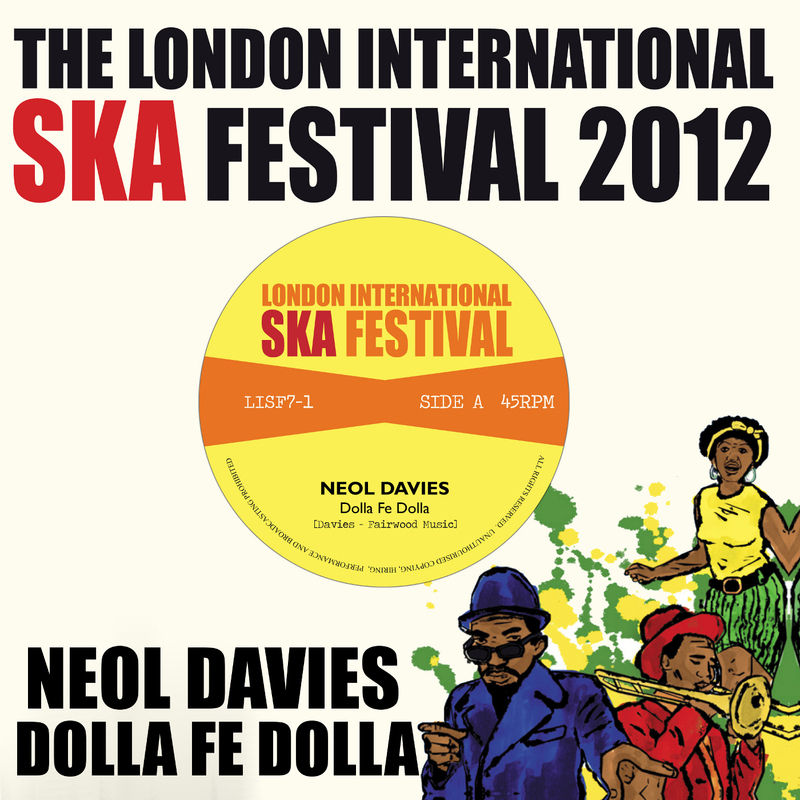 As one of 2 Tone Records greatest musicians, songwriters and founder of The Selecter, Neol Davies is back with a superb new single ‘Dolla Fe Dolla’ which was recorded exclusively for The London International Ska Festival 2012 and is now finally available on vinyl from Phoenix City Records and from iTunes. I've been meaning to post about Davies (who I interviewed a few years back) for some time now and his new music in particular. I have a very soft spot in my heart for him and for Pauline Black. The first real tour my band Bigger Thomas ever did was during the summer of 1991 as support for The Selecter when they re-formed for tour the U.S. They were both very kind to us and it was surreal at times to be standing off stage and watching two of my musical heroes perform songs that formed the soundtrack to my musical education. As such, I was excited to finally hear a recorded version of some of the new material Davies has been writing of late. According to an interview Davies recently did with M Magazine explaining the stories behind many of classics he wrote for The Selecter, the new song is built on a hypnotic chord change that builds towards a tension that is released when he slides into one of his memorable solos. "Dolla Fe Dolla is a new song I’m very happy with. It’s going to be on a 7” record exclusive to the International Ska Festival. Everybody I’ve played it to really likes it, it’s a song about the current times of financial mess-around and how money just drives everything and again, commenting on hypocrisy – all my favourite subjects! The way writing usually works for me is finding a groove or a few chords on my guitar and the best times are when that happens and a hook phrase comes too. This is one of those songs where that happened. I started messing about with a really simple chord change: G, B-flat, back to C and after a few dozen times of doing that I started to sing the main line ‘Dolla, Dolla, fe Dolla, Dollar’, just like I got the hook for On My Radio. There was space for a little melodic hook between the main refrain and so I put a little line ‘Buy Everything’ in between. Straight away I could see it was a great way to split voices – the backing singers doing the main hook and the lead voice singing the phrase in between, which is a thing I like doing, part of my style perhaps. The verse needed a bit of work but I like to keep the groove simple without it sounding too simple and I got a little bit of blues in there with the bassline. It has one of those chord sequences where it’s crucial to get the tempo just right – if it’s too slow or too fast it sounds a bit awkward and we spent a lot of time just getting the rhythm guitar – the off beat -against the main beat to make it really danceable." 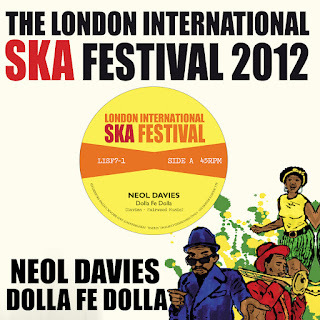 Davies and his band headlined the London International Ska Festival in early May. Below are a selection of live songs performed at the festival including a mix of new songs (Dolla Fe Dolla, Shake The World), old songs (Too Much Pressure, Three Minute Hero) and a cover. Based on what I can gather, Davies had a special guest on organ. That's right, Jerry Dammers of The Specials, sat in with the band and you can hear his handiwork on The Skatalites classic "Reburial" below. Look for Dammers on the left side of the stage.